This group of roses is so amazing and I have so many great roses yet to paint. Of this set, I love the Double Delight as you might guess. This was my first rose in the sense that my grandmother introduced this rose to me while showing me her rose garden. Even as a high school kid, it was an experience I never forgot. Later, well into my art explorations, I decided to paint a rose and Double Delight was my first subject - the painting went well and I have been painting roses ever since. 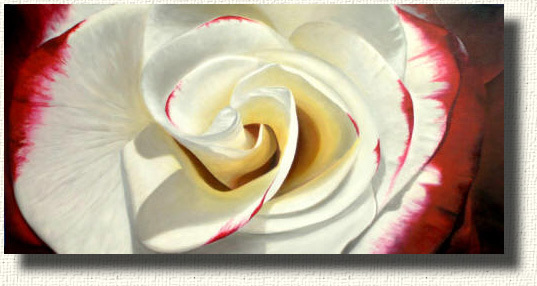 My first rose painting was a Double Delight, my second rose was a Rio Samba. This is my second painting of Double Delight. It is an oil on canvas, 24" x 48". I offer these paintings to galleries and they are "gallery wrapped" , on heavy frames (stretcher bars). The result is an oil on canvas painting that does not need a frame. The double in Double Delight is for the beauty and the scent - both spectacular! This painting is available as a canvas print over-painted by me making it an original print - meaning each print is different. The over-painting makes the color more intense and the print becomes very similar to an original but is marked and signed as a print. This is the fully developed version of the rose above - same rose, just older - she ages with dignity. We have 3 to 5 of these bushes growing in our garden in most seasons. Each plant seems to have its own personality and the roses are usually a little different from plant to plant. Double Delight gives me a chance to use the oil paint pigment called "Alizarin Crimson". Alizarin is my favorite of all pigment colors and is very transparent. The transparency allows me to paint the color as a glaze and the more layers I paint the deeper and more intense the color. Gemini is a lot like Double Delight - a powerful scent and a bright beautiful rose. Gemini seems brighter then Double D as I call Double delight. Gemini is a kind of bright, optimistic, and intense rose. The red in this rose is brighter and more to the orange side then Double D. There is a very transparent red made by Gamblin that is perfect for this rose. This painting is 24" x 48", oil on canvas, and is available in a gallery in Napa Valley representing me. If you are interested in seeing this rose, please contact me through the Contact Me page. Gemini ages as well as Double Delight. 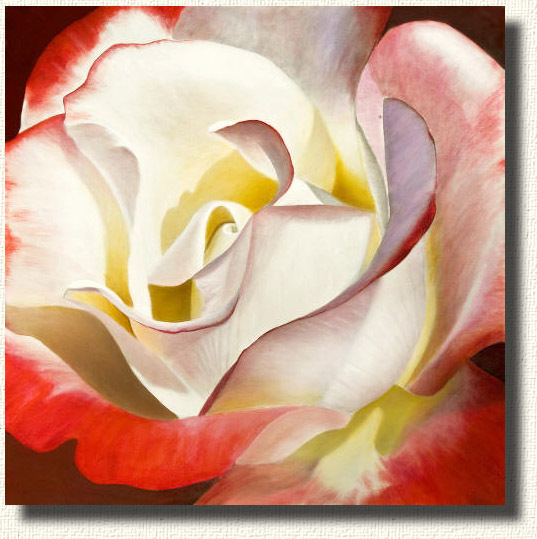 This painting is of a full and developed rose with intense color and curved, complex, petals. The center color is yellow and cream, but makes a transition to white and then to intense red. I paint from the center out so I make the same transitions in color, age, and rose development as the petals themselves make. I become very familiar with each part of the rose. 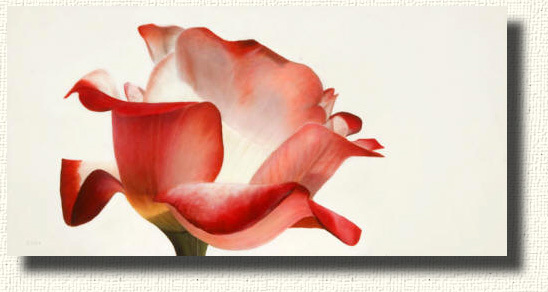 I try to paint the young center petals softness and the complexity and detail of the outer petals. I enjoy painting the detail of the veins and some of the complex imperfections to make the rose real and less of a Valentine's Day illustration. 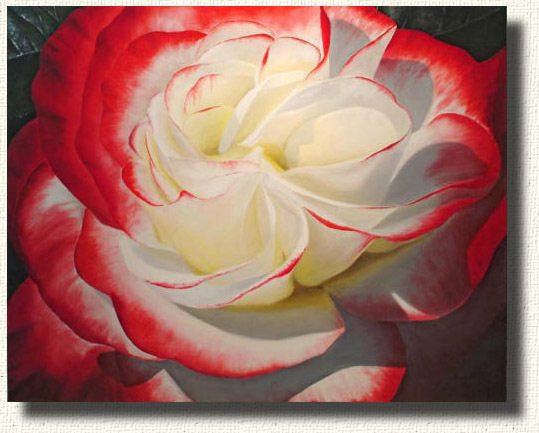 In the outer regions, I enjoy getting to the large petals where I can apply layers of transparent red, vein structures, and complex light patterns.